San Antonio’s stars were dimmed, but White and Forbes were clutch. In a back-and-forth game that the Spurs held the lead for most of the way, the Nuggets repeatedly fought back to trim the lead, San Antonio was able keep the Nuggets down with some timely defense and rebounds. DeMar DeRozan struggled shooting the ball but was able to grab 12 rebounds and drop in 18 points. The Spurs limited Nikola Jokic’s scoring but could not limit his assists to teammates (team-high 14 assists). Both teams started out jittery on the offensive end but soon settled into a groove. After trading a few leads early on, the Spurs were able to pull ahead throughout the second quarter heading into the half. A low-scoring third gave way to a furious finish in the fourth quarter. 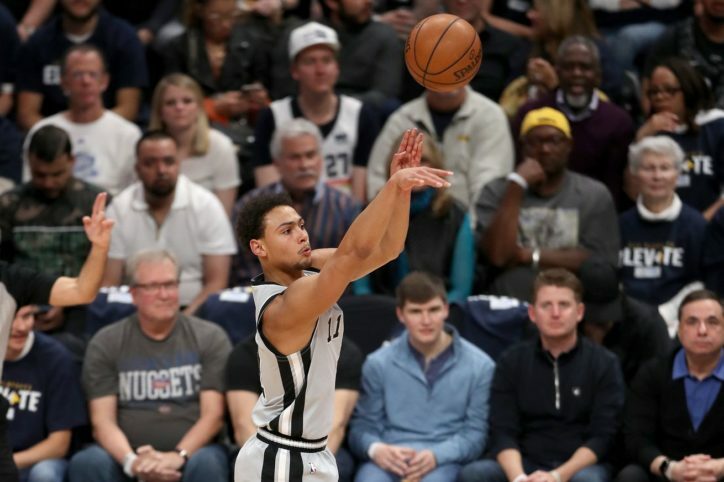 Derrick White stole a pass with 1.3 seconds left, and the good guys stole game 1 against the Nuggets. Nikola Jokic’s footwork is such a work of art, which makes him very nimble in the paint. Two quick fouls sent Derrick White to the bench—nerves and adrenaline most likely. He was his usual calm and cerebral self by the time he checked back into the game. Bryn Forbes and White were aggressive all night and very efficient. LaMarcus Aldridge, as he’s done all year, doing the dirty work like boxing out and scoring putbacks. Both Aldridge and White were in foul trouble early, keeping their minutes and impact lower than it should be. Jamal Murray does not miss against the Spurs. DeMar DeRozan played with a controlled urgency, know his importance to the Spurs but not having the sole weight of pressure on his shoulders. That being said, the Spurs’ top two leading scorers (Aldridge and DeRozan) had trouble scoring most of the night. I like to think that somewhere, Tim Duncan, Tony Parker, and Manu Ginobili are spending the playoffs together with LeBron James at a beach bar in Miami. San Antonio stays in Denver for Game 2 on Tuesday, April 16, 2019 at 8:00 PM.